A map of TV and mobile-phone usage looks like a 50-year history of the growth of the global middle class. When I shared my highlights of Mary Meeker's ginormous presentation about the future of the Internet, one graph got more attention than everything else combined. 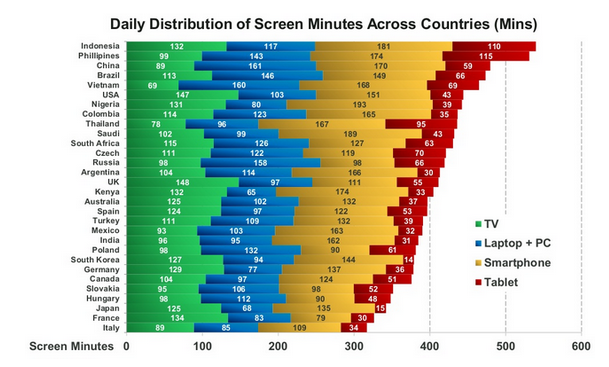 It's the chart that leads this article, which shows screen time by screen type around the world. And for those of you who prefer maps, here are two maps showing TV and smartphone use around the world. What do the maps tell us? An super-oversimplified observation is that the U.S. and Western Europe watch a lot of TV, while Asia and other developing economies are disproportionately heavy in mobile and tablet use. One explanation—honestly, a rationalization more than a causal variable—is that habits die hard, and rich, old capitalist democracies still watch a lot of TV, because it's what they're used to. The middle classes of the U.S. and Western Europe got rich in the 1950s when TV penetration was screaming past 50 percent. In the 21st century, smartphones are the new TV—the hot new glass that signals the future of attention and entertainment—and the countries that spend the most time on their phones (particularly relative to other products) are countries that only now are joining the global middle class.